Kanban is an approach to developing technology or service organizations that is gaining enormous popularity in companies all around the world. It is widely used to improve the organization's transparency, stimulate collaboration, increase productivity and efficiency. Specialists consider Kanban to be a revolutionary system that can significantly reduce waste and help companies save money for future development. Kanban is about learning how to optimize your current processes and identify opportunities to effectively improve them. It helps to organize the chaos by making the workflow and its steps visible, limiting the amount of work, making process policies explicit and developing ways of working using different models together with stakeholders. 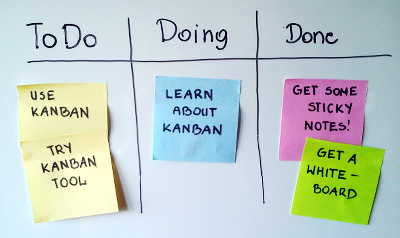 The most important tool that is used along with this method is a Kanban board. This is a whiteboard divided into columns reflecting the real workflow. Different kinds of work items are described by different card colors. New technologies and the dynamic expansion of the Internet have irreversibly affected our lives. They have changed the way we work and spend leisure time. Thanks to the technological development we have at our disposal smart and very effective tools that simplify our work and help us achieve better results. You can use a physical board to organize your projects into tasks, but there are at least 5 reasons why you should try an online Kanban board. Online Kanban software development never ends. Software providers constantly enrich Kanban boards by adding new features, improving the design and the usability. They do their best to deliver an excellent service to their customers. Kanban online is a perfect solution for distributed teams. Kanban Tool helps you to communicate and collaborate with your team members in real-time, anytime and anywhere. Improve productivity in your organization by sharing information, tasks, and comments with all of your team members. Web-based Kanban boards can be easily integrated with other applications and computer systems to allow you to automate and speed up your work. There are many possibilities - you can use Zapier service or flexible API to synchronize online Kanban with other systems. Also, you can try out Chrome apps such as Kanban Tool or extensions like Kanban Tool "add task button" and Kanbanira. Check out RSS feeds for Kanban boards, email notifications and reminders as well as calendar integrations. Also, use Kanban Cast as an information radiator. Kanban online simplifies and automates the process of gathering and analyzing workflow metrics by providing insightful Kanban analytics. They allow you to measure the project performance and help in diagnosing causes of problems. Cumulative Flow Diagram is used to identify bottlenecks while Breakdown Charts provide you a quick insight into project status. Lead and Cycle Time Diagrams present the average amount of time it takes for a task to be processed from the specified start to the finish point. You can simplify the analysis using data filtering features and extensive search capabilities, export and import reports to Excel and CSV files and save on your computer. Frequent feedback increases team's productivity and improves overall performance. Using Kanban online makes your data and all important information completely safe. Online Kanban board providers ensure full and daily off-site backups of everything you have created in the application. Advanced account access privileges as well as project/board access privileges help you to define team roles. Random password generator protects your company from information disclosure. Kanban online is for you! You know that your team can do better. You know that your business can grow faster. So, why not to do something about it? See what results you can achieve using Kanban method. Try out online Kanban boards and shorten your way to success. Test how Kanban Tool can improve your projects' performance. Register for a free trial now!